You’ll love making your own healthy, homemade taco seasoning mix. No fillers, MSG, or weird chemicals–and you can make it as hot or mild as you like! J-man (age 11) recently discovered a song called “It’s Raining Tacos.” (You can check it out here.) I think our family would love it if it rained tacos–they request them every week when I’m meal planning. Because we grow and dry a lot of our own herbs, I thought it would be fun to make my own taco mix. That way, I know exactly what’s in it (no MSG or fillers, for example) and I can make it hot or mild, depending on our tastes. It took a few tries (including some 4-alarm spicy fails! ), and we ended up with this as our favorite combination of flavor and spice. You can use this taco seasoning mix with beef, turkey, or chicken–ground or shredded. Yes, this is a great way to use up leftover turkey after Thanksgiving! This makes enough seasoning mix for 1 pound of meat. Combine all ingredients and store in a canning jar or other airtight container. Add to 1 pound of cooked hamburger or ground turkey with 1/2 cup of water and simmer until most of the water has evaporated. 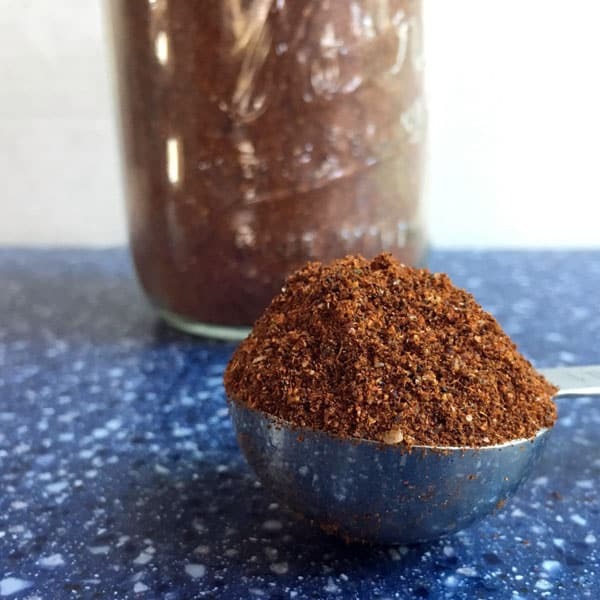 If your family is taco-crazy like mine, you’ll probably want to make a giant batch of taco seasoning mix and store it in the pantry. Combine all ingredients and store in a canning jar or other airtight container. Add 1/4 cup of mix and 1/2 cup water for every pound of cooked hamburger or ground turkey. Simmer until most of the water has evaporated. Spice up your baked potatoes or sweet potatoes. You'll love making your own healthy, homemade taco seasoning mix. No fillers, MSG, or weird chemicals--and you can make it as hot or mild as you like! Combine all ingredients and store in a canning jar or other airtight container. Add to 1 pound of cooked hamburger or ground turkey with 1/2 cup of water and simmer until most of the water has evaporated. Yep — that’s good stuff Mama. Wifey and I do the same here — although I’m a tad more partial to the garlic salt. Mom always used to buy those packaged mixes? Blech! Next time you use your Owen, after is cooling down (Empty) …… AD on the sliced Garlic (low temperature)… when Garlic slices dried – in a spice blender, blend them with your choice of Salt (I use Pink Himalayan Salt) and voila you have Home-made GARLIC SALT with no MSG & preservatives that’s cost pennies :o) ….. Thanks for this – if salt is an issue here, what would you recommend to keep the flavoring? I’ve been wanting to make our own batches of taco seasoning since we use this about once a week. Here from Ultimate Recipe Swap. You could also dry your own garlic from fresh garlic minced, and use sea salt. 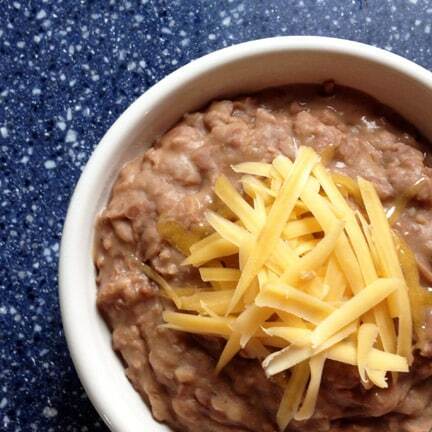 For the best ever bean dip, add three tablespoons of the taco mix to a 15 ounce can of refried beans, 1/4 cup sour cream and 8 ounces of jack cheese. Mix well, bake in a oven proof container for 25-30 minutes, or until bubbly. Enjoy! Gail. Thank you! I have been trying to replace as many store-bought items as possible and have been looking for a recipe for this. I will try it this week. This is awesome! My son has celiac & a lot of taco seasonings have wheat in it. This will make all of our lives easier! How do you make your own chili seasoning? I’m on a sugar-restricted diet and have a hard time finding sugar-free chili mix. I add similar ingredients plus a pinch of mustard powder, tumeric and paprika to 50/50 cream cheese and creme fresh, blended, then add equal to total volume, your favourite cheese. then microwave it for about 30 seconds to make an amazing cheesy taco dip, perfect in wraps, for wedges etc..